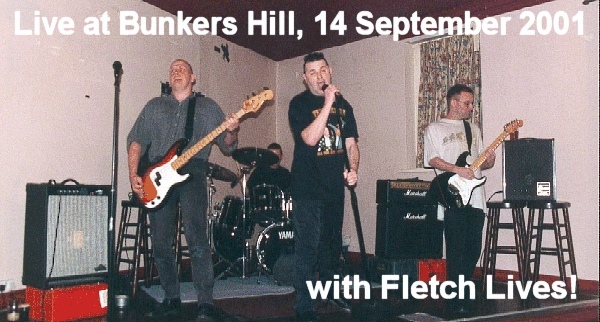 A select and discerning audience turned out for Pointy Boss's first foray upstairs at Hockley's Bunkers Hill, where support was once again provided by Pointy live favourites Fletch Lives! 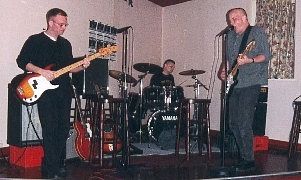 With the bulk of the audience initially prefering the range of beers on offer in the downstairs bar, an even more select few enjoyed a brief impromptu Pointy Boss three-piece set of classic covers, before Fletch Lives! took to the stage, for a first-rate set. Undaunted by the absence of a full PA to mix their sound, Pointy Boss (in classic four-piece mode) then took it upon themselves to knock out a set of fresh-punk classics old and new. With ticket prices waived in favour of a free gig, the band were bound to end up out of Pointy pocket  which was the one downer on a good evening. Bunkers offers a great small venue, but the 'deal' offered by the current landlord is so tight-fisted that many bands are put off returning to the venue for a second time. With a change of landlord in the offing, Pointy Boss will approach Bunkers again to check out the new regime! ABOVE: Pointy Boss three-piece: BELOW: Fletch Lives!